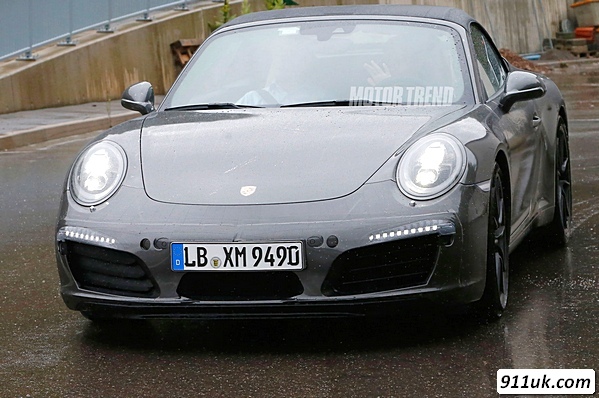 So is the 911 about to head into a forced-induction-only future? If the strong rumours from our sources are correct, the answer to this question is a resounding ‘yes’. 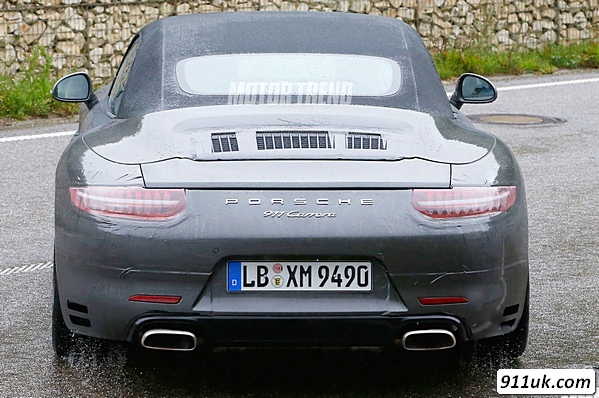 Because of this, the spy shots you see before you aren’t of a second-generation Porsche 991. 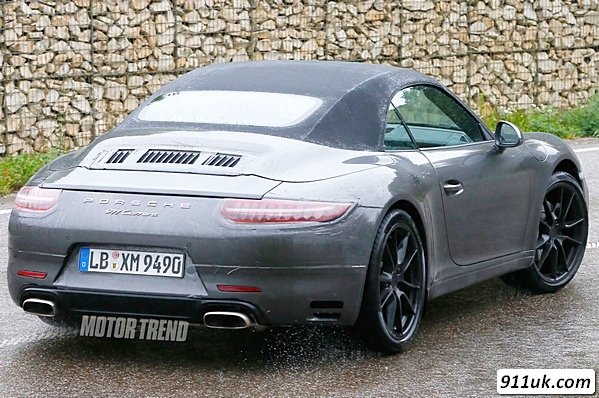 Nope, this is the Porsche 992. The rumours of the entire Porsche 911 range turning turbocharged are proving hard to ignore with the next Porsche 911 Carrera will be released with a forced induction motor and a new type code to recognise this large-scale change in philosophy. While the change may spell the end of the naturally aspirated powerplant in the Porsche 911, flat six enthusiasts have no need to panic. The engine will still be mounted out the back and there will still be six cylinders in the famous ‘boxer’ arrangement. So, the Porsche 992 – that’s its predicted internal name – will feature a smaller capacity engine, likely with twin turbochargers (as the current 991 Turbo has now). This will help with Porsche’s drive to improve performance and fuel economy while reducing CO2 emissions. The car seen here is not your average blacked-out, taped-up test mule however. 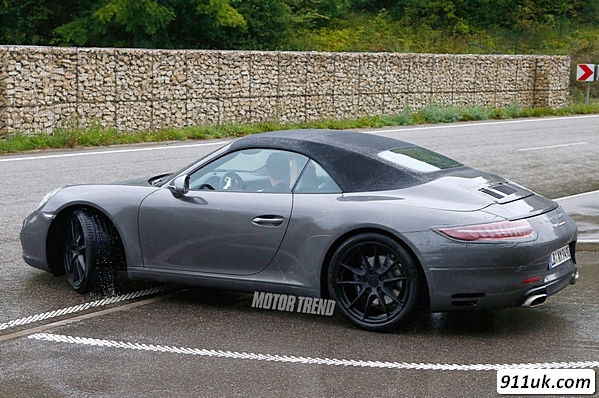 Looking resplendent in a mid-grey metallic, this pre-production 911 Carrera Cabriolet looks almost ready to launch. The front and rear is taped up. Looks like a 991 to me. 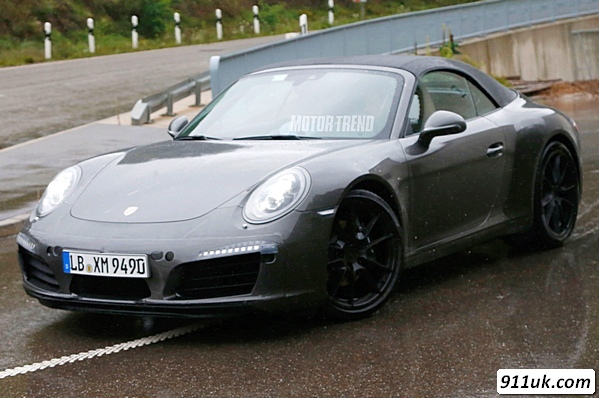 The first 992 will be as a GTS, not Carrera? Ugh? What's with the vertical engine vents (or whatever they're called)? Rear lights look like the Gen.2 9997. Looks like a 991.2 to me. Hard to believe a new type number wouldn't be more distinctive from the outside. 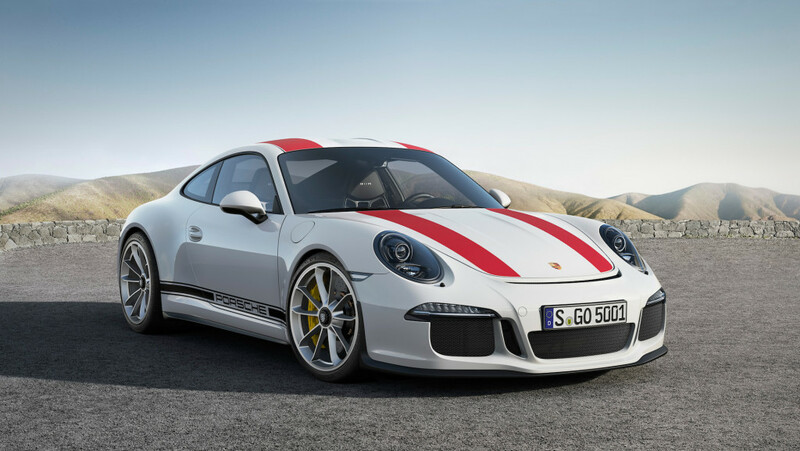 The Porsche 911 R Is A Purist’s Driving Nirvana 493BHP engine with a six speed manual only!!! 991 and 997 share the same door handles. These are different. One part I do like is the clean straight line from the roof onto the rear engine deck. The continuation is sleek. Agree the horizontal vents would of looked better then vertical lines. Presumably they are vertical to increase air flow into the engine bay and air box. On the cars that do have the vertical slats (rather than previous legacy/historic horizontal slats), the channeling is 2/3 induction 1/3 intercooler - ie 991.2 turbo defined. The 911R (and others) don't have the vertical slats. The lifespan of a car model seems to be getting shorter and shorter. I miss the days of the R129 Sl where the car was in production for over 10 years... I can only hope now the prices come down so they can be picked up by some of us mere mortals with not so deep pockets..
Now they are owned by VW they are like what Disney has done to Star Wars.